The 2000s, especially after 2004, constituted a distinct period for the Brazilian economy, featuring sustained economic growth. According to data from the Brazilian Institute for Geography and Statistics (Instituto Brasileiro de Geografia e Estatística—IBGE), the country’s Gross Domestic Product (GDP) rose from BRL1.2 trillion in 2000 to BRL5.6 trillion in 2014, with growth every year except for 2009, when it fell by 0.1 per cent due to the international economic crisis. Inequality indicators followed the same trend, with the Gini index decreasing from 0.570 in 2004 to 0.515 in 2014. As a result, there was a significant decrease in poverty. Extreme poverty decreased almost by 68 per cent between 2004 and 2014, an average reduction of around 10 per cent per year. The positive economic situation (generating a primary surplus), the increase in the minimum wage, the Bolsa Família conditional cash transfer programme and the creation of the Ministry of Social Development and Fight Against Hunger (Ministério do Desenvolvimento Social e Combate à Fome—MDS) in 2004 all favoured government action regarding social policy, especially increased social public expenditures. 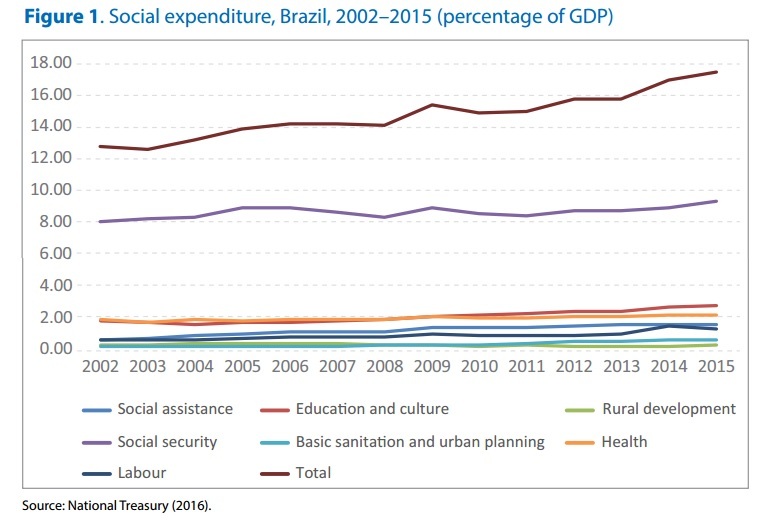 Figure 1 highlights some areas of Brazilian social policy, showing the increase in public expenditure from 13 per cent of GDP in 2002 to 17.5 per cent in 2015. Thus, the rise in expenditure represents over 3 percentage points of GDP, with a special emphasis on: a) education and culture, an increase of 0.74 percentage points (pp) of GDP; b) social assistance (0.78 pp of GDP); and c) social security (0.97 pp of GDP). At the same time, expenditures on health remained stable, and agricultural organisation and sanitation were not expressive throughout the same period. With the international financial crisis between 2007 and 2008, there were mounting expectations regarding the decline in performance of the Brazilian economy and its capacity to maintain positive indicators. This negative atmosphere worsened after then-president Dilma Rousseff announced countercyclical measures to face the international crisis, together with corruption scandals involving high-ranking officials in her administration. This led to an extremely serious political crisis, which culminated in the president’s impeachment and removal from power. In the aftermath, a recessive adjustment of public accounts began, with higher interest rates and a reduction in the availability of credit and public spending, among other factors that directly affected economic and social indicators (rising inflation and unemployment), with a worsening forecast for coming years. Given the difficulties faced by the Brazilian population in the past, it is important to understand the current situation by preserving the gains made in the last decade, especially towards the maintenance of social policies. Therefore, it is important to analyse social policy in Brazil, demonstrating its evolution and its positive impact over poverty and inequality, with the central hypothesis that the adjustment mechanisms currently in place in the Brazilian economy are tending to reverse the expansion and even the continuation of progressive social policies. National Treasury. 2016. Gasto Social do Governo Central, 2002 a 2015. Brasília: National Treasury. Silva, Patrícia A.O. 2017. “Social Policy in Brazil (2004–2014): an Overview.” IPC-IG Working Paper No.155. Brasília: International Policy Centre for Inclusive Growth.